As Wigan’s fans watched their overjoyed players celebrate the narrow escape from relegation on the last day of the season by first soaking their manager Roberto Martinez in champagne, then throwing the Spaniard into the air, their emotions were surely a mixture of delight and relief. After all, Wigan had been written-off by all and sundry for the majority of a campaign that had started disastrously with two thumping great home defeats, 4-0 to newly promoted Blackpool and 6-0 to reigning champions Chelsea. The team languished in the bottom three for virtually the entire season and was still in the relegation places with just 13 minutes to go before Manchester United did them a favour by taking the lead against plucky Blackpool. 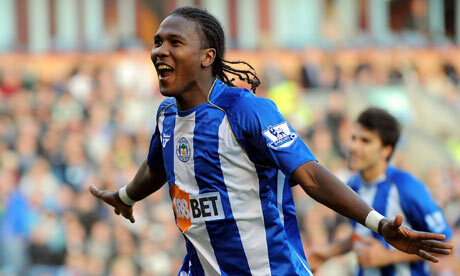 As it turned out, Wigan did not need any assistance, as Hugo Rodallega’s headed goal was enough to secure an unlikely win at Stoke City. 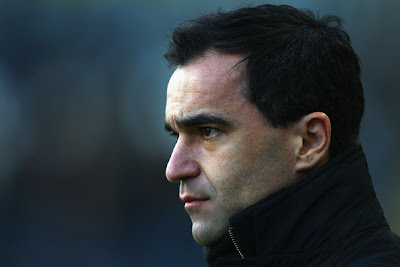 The result was a triumphant vindication of Martinez’s belief and tactical intelligence, as his players finally found the fighting qualities to go with their technical skill. "Hugo Rodallega - priceless goal"
Wigan Athletic is indeed a club of humble tradition, only elected to the Football League in 1978, but they have what Roberto Martinez calls a “fantastic story.” When Whelan purchased the club in 1995, it was still in the fourth tier of English football, but the local millionaire promised that the club would soon be playing in a new stadium and that he would take the club to the Premier League within 10 years. At the time, this seemed little more than the bluster of a man accustomed to getting his own way in the business world, but he has delivered exactly what he promised. Wigan started off by winning the Third Division in 1996/97, a feat they repeated in Division Two in 2002/02, thanks to considerable investment in the team, including prolific goalscorer Nathan “Duke” Ellington. Just two years later, they secured automatic promotion to the Premier League as runners-up to Sunderland, when they defeated Reading 3-1 on, you guessed it, the final day of the season. 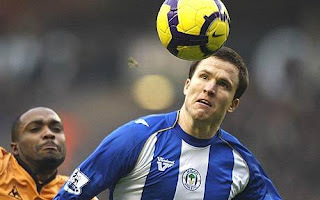 Despite being every pundit’s tip for the drop, Wigan finished a highly creditable tenth in their first season at the highest level, also reaching the final of the Carling Cup, where they were beaten by a rampant Manchester United. Since then, Martinez has flourished in his second homeland. His first managerial role saw him lead Swansea City to promotion to the Championship, while introducing a brand of attractive, passing football that won many admirers. 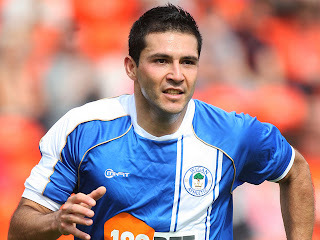 He has continued this progressive approach at Wigan and is now rated as one of the brightest young managers around. Indeed, Whelan has said that Martinez is the best manager he has worked with in football and it might be tough to hold on to him if a leading club came knocking at the door. However, despite all of Martinez’s achievements, he’s not actually the most important man at the football club. That description surely applies to Dave Whelan, who arguably kept Wigan Athletic in existence when he purchases the club for £1 million in 1995. Although this was a trivial sum for a man who had become wealthy from his JJB Sports retail empire, he has since pumped in considerably higher sums of money to finance the club’s rise up the divisions. 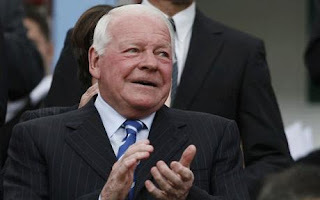 A former footballer, Whelan is now better known for being a shrewd businessman, but that has not prevented him from investing a substantial slice of his fortune into the team he supports – in both senses of the word. 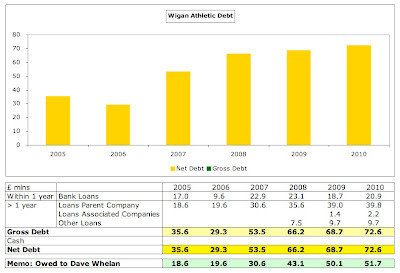 It is clear that Wigan fans owe Whelan a great deal – quite literally, in terms of the club’s debts. 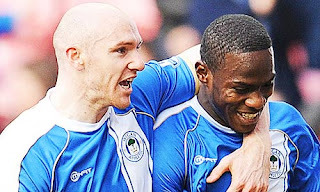 As at 31 May 2010, Wigan’s net debt stood at a hefty £73 million, which is the 9th highest in the Premier League. Although it’s a drop in the ocean compared to the debts at the likes of Manchester United and Chelsea, it’s very large compared to an annual turnover of £43 million. This debt includes a £21 million bank loan with Barclays Bank, which is repayable on demand and secured on the company’s assets. However, the good news is that the vast majority of the club’s borrowings (£52 million) comprises “soft” debt owed to the owner via a number of group companies: Whelco Holdings Ltd £39.8 million, the Whelan Family Bare Trust £9.7 million, Dave Whelan Sports Ltd £1 million, E-view Properties Ltd £0.6 million, Pooles of Wigan Ltd £0.5 million and Yeshili Reflective Material Co Ltd £0.1 million. Whelan’s generosity is highlighted by the fact that all of these loans have no fixed repayment dates and are unsecured, which means that the owner has no guarantee of repayment at all. Furthermore, almost all of the loans are interest-free, except for £7.5 million on which interest is accrued at 5% per annum. This really helps the club financials, as it significantly reduces interest payments, e.g. if 5% had also been applied to the remaining loans, the club would have had to find another £2.2 million interest every year. "Ali Al-Habsi celebrates his player of the season award"
Jonathan Jackson, Wigan’s chief executive, described this move as “pre-emptive action to reduce the debt, for the long term financial health of Wigan Athletic Football Club” and it is certainly a great gesture by the chairman. Not only does it strengthen a weak balance sheet, but it also means that if he walks away for whatever reason, then the club will not be saddled with large debts. "The name's N'Zogbia, not Insomnia"
Interestingly, last year Whelan wrote to Premier League chief executive Richard Scudamore, proposing that clubs should not be allowed to borrow sums that represent more than 25 per cent of their annual turnover, even though Wigan have been a long way above the suggested threshold for many years. This is just one example of Chairman Dave’s thoughts on football, as he has made the most of his position to give everyone the benefit of his views on the game. If we were to be kind, we would say that he speaks his mind, but some of his pronouncements must surely make Wigan fans cringe, such as when he undermined the team’s morale by blaming the 9-1 defeat to Tottenham in 2009 on “dodgy signings”. However, it’s when he starts lecturing others on financial probity that he’s on the weakest ground. It’s all very well complaining about a debt culture, but when your own club’s spectacular rise has been built on debt, it does seem a bit rich (if you’ll excuse the pun). 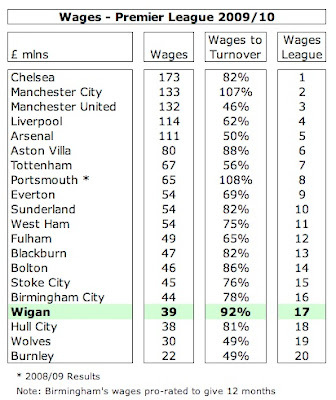 It’s the same story when Whelan criticises high salaries, while Wigan’s wages to turnover ratio stands at more than 90%. If the two leading characters at Wigan Athletic were to be characterised by songs by The Smiths, then Roberto Martinez might well be “This Charming Man”, but Dave Whelan would surely be “Big Mouth Strikes Again”. Some fans have also carped that his companies have benefited from a lot of free advertising and publicity, due to his association with Wigan Athletic, particularly the stadium name and shirt sponsorship. While this is undoubtedly correct, the financial cost to Whelan has clearly far outweighed the benefits. He has not taken any director’s salary over the years and only received annual interest of £375,000 since 2009. Instead, a club spokesman estimated that he has put over £100 million into Wigan Athletic during his tenure. The importance of this funding is evident when examining Wigan’s financials. 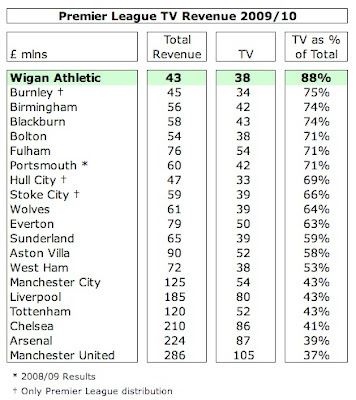 The stark reality is that Wigan are simply not profitable. In the last six years, they have only managed to once report a profit, £9 million in 2005/06, which was their first year in the Premier League. Since then, the club has made a series of losses, though, to be fair, the trend has been improving for the last three years: 2008 £11 million, 2009 £6 million, 2010 £4 million. The reason for the turnaround from the 2006 profit is obvious: wages have increased by £20 million, while revenue has only risen by £8 million in the same period. Moreover, just about all of that revenue growth has come from higher television deals with match receipts and commercial income virtually flat. In a way, it’s understandable that Wigan have felt the need to increase player wages and buy new players in order to give the club the best chance of surviving in the Premier League, but it’s hardly a sustainable model. In fairness, Wigan have started to exercise a degree of cost control with the £3 million fall in revenue in 2010 more than matched by a £4 million reduction in operating expenses. That said, the accounts predicted more trading losses in 2011 before taking into account player trading income. That’s almost certainly an accurate forecast, given that Wigan have averaged £16-17 million operating losses during the last three years. 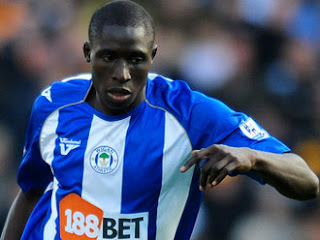 "Mohamed Diame - loves the Wigan lifestyle"
However, the other part of the prediction is an important factor in Wigan’s financials with profit from player sales contributing £13 million in each of the last two seasons, mainly from the sales of Wilson Palacios to Tottenham in 2008/09 for £12 million and Luis Antonio Valencia to Manchester United in 2009/10 for £16 million. However, Wigan have also warned that “these past gains may not continue to be repeated within the current spending restrictions being experienced by the majority of football clubs.” Indeed, chief executive Jackson went further, “The strategy moving forward must be to increase turnover whilst controlling costs to enable the club to achieve organic growth and reduce the reliance on selling players. The bottom line is the club cannot continue to suffer losses every year.” An admirable objective, but that’s going to be a tough ask. To clarify that remark, in my opinion Wigan have a reasonable chance of reaching break-even overall, but it’s going to be very difficult to achieve without a healthy contribution from player sales. Their loss before tax of £4 million is actually one of the smallest in the Premier League with only six clubs reporting better figures last year. 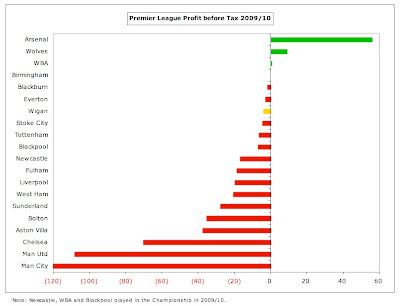 In fact, only four clubs in the top tier registered profits and two of those were negligible. The losses at many clubs are significantly higher than Wigan with the two Manchester clubs both having deficits well over £100 million. In a way, this is proof of Wigan’s ability to make the most of their limited resources, as they are bound to struggle to financially, given their low revenue. In fact, it’s the lowest in the Premier League at £43 million. In 2009/10, the last season for which accounts are available, this was even lower than Burnley and Hull City. Even clubs like Blackburn Rovers, Birmingham City and Bolton Wanderers, which are hardly big hitters, earn £10-15 million more than Wigan. That’s an enormous difference for clubs operating in the lower reaches of the division. When you look at Wigan’s revenue mix, the reasons for their relatively low revenue become blindingly obvious: gate receipts and (especially) commercial income. 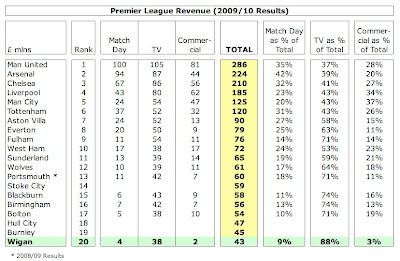 In fact, the club is almost entirely reliant on TV money, which represents a staggering 88% of its total revenue. Not only that, but it has driven almost all of the revenue growth over the last few years. For example, the £16 million growth in 2008 was totally due to the new television broadcasting deal signed with the Premier League. Merit payments from the TV deal, which depend on final league position, have also played their part, being largely responsible for the £8 million revenue decline in 2007, the £3 million increase in 2009 and the £3 million fall in 2010. Unsurprisingly, Wigan’s dependency on television for their revenue is the highest of all Premier League clubs at 88%, even though their £38 million is nowhere near as much as the leading clubs earn, mainly due to the money those teams earn from the Champions League. The nearest “challengers” to this unwanted title in 2009/10 were Burnley 75%, Birmingham City 74% and Blackburn Rovers 74%, but in truth Wigan are in a class of their own here. Given this unhealthy reliance, it is worth exploring in detail how the Premier League distributes its TV revenue to the clubs. Much of it is shared out equally, namely 50% of the domestic rights and 100% of the overseas rights, but not all of the money is allocated in this manner. Merit payments account for 25% of the domestic rights with each place in the final league table being worth around £750,000, which we have already seen can make a big difference to Wigan’s financials. So, if Martinez were to achieve his aim of finishing in the top ten, that improvement would be worth another £4.5 million. In addition, the remaining 25% of the domestic TV rights comes from the facility fee, which is based on how many times Sky broadcast a club’s matches live. In the last three seasons Wigan were shown the minimum ten times, while the viewing public was treated to Manchester United the maximum 24 times, which produces a £7-8 million difference in revenue between the two clubs. 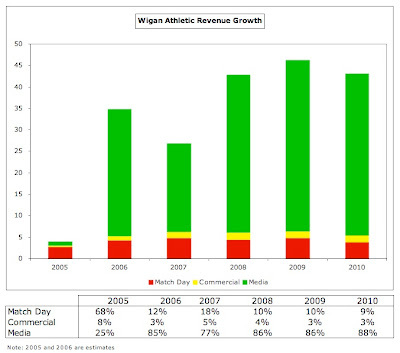 We have seen how Wigan’s turnover is heavily influenced by the timing of broadcasting deals, with the significant increase in 2008 revenue being due to the new Premier League agreement. Happily for the Latics, they can anticipate a similar boost to revenue in next year’s accounts, as the central payments from the latest three-year deal, which kicked off in the 2010/11 season, will climb by £6.4 million, largely thanks to the steep increase in overseas rights, based on recently published figures. As we saw earlier, Wigan’s match day revenue is a genuine competitive weakness. At the two ends of the Premier League spectrum, we have Manchester United’s £100 million compared to Wigan’s £3.8 million. To place that into context, United earn almost as much for one game (£3.6 million) as Wigan do over the entire season. This is a function of a number of factors, including corporate hospitality and premium seating, but the main reason is the low crowd figures. Last season, Wigan’s average attendance of 16,812 (just 67% of the stadium capacity of 25,138) was the second smallest in the Premier League, only behind Blackpool, whose capacity was restricted to 16,220. In fact, Wigan’s attendances have fallen 18% since their first Premier League season in 2005/06, when they attracted an average of 20,609. Last season’s decline was attributed to “difficult economic conditions in the North West”, which in fairness is an entirely valid reason for many not to go to the football. Despite these initiatives, the crowd figures remain stubbornly low, but there are two ways of looking at this. The first (negative) reaction might be that this demonstrates that the town of Wigan is simply too small to sustain a Premier League club. On the other hand, the attendances could be considered an admirable, if not miraculous, achievement for a town of Wigan’s size (with a population of around 80,000). This is even more the case, if you consider: (a) Wigan’s proximity to Manchester and Liverpool with their more glamorous clubs; (b) the popularity of the local rugby league club, the Wigan Warriors, with surveys suggesting little cross-over between the two sets of fans. In any case, even if Wigan were to somehow attract an additional 5,000 fans, taking them above their previous record average attendance, that might generate a better atmosphere in the ground, but it would not make a substantial impact on the club’s revenue. Assuming those 5,000 paid the £270 for a new season ticket, that would only produce an additional £1.35 million revenue. That would be useful, but it’s not going to revolutionise the club’s business model. 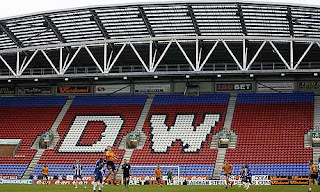 When Wigan opened the new stadium in 1999, it was one of the largest outside the Premier League. While the ambition has to be applauded, in hindsight it’s tempting to think that they should have opted for a smaller ground. The stadium is actually owned by another one of Dave Whelan’s companies, Wigan Football Company Limited, which has granted the football club a 25-year lease at rates determined by match revenues, resulting in a £1.1 million charge for the 2009/10 season. Shared with the Wigan Warriors, the stadium was initially named the JJB after Whelan’s old company, but changed its name to the DW Stadium in August 2009 after another Whelan venture, the DW Sports Fitness Company. Wigan’s commercial income of £1.5 million is also ridiculously low. Although it might be unrealistic to measure this against Manchester United’s £81 million from this revenue stream, a valid comparison would be Blackburn Rovers, who generate £9 million from commercial activities – six times as much. Many Wigan fans have complained that Dave Whelan got his JJB shirt sponsorship on the cheap and there’s something in that, as the deal was only worth £225,000 a season. However, the replacement deal signed in 2009 with 188Bet, an Asia-focused online gambling company, only produced £650,000 a year (less than the £750,000 paid by the same company to Bolton Wanderers), instead of the hoped for £1 million, which suggests that Wigan are not yet an attractive commercial proposition. This gives the lie to Whelan’s view that the club had “become a global brand” on promotion to the Premier League. These days, Whelan’s views have changed, as he said smaller clubs’ ability to exploit commercially the Premier League’s popularity overseas is low, because fans abroad are drawn to the clubs that Sam Allardyce refers to as the “big boys”. 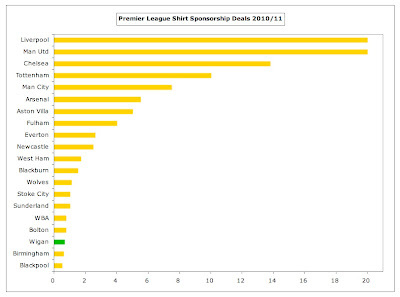 This can be seen by the mega £20 million shirt sponsorship deals signed with Manchester United and Liverpool, emphasising the polarisation between the top tier clubs and those struggling at the bottom of the division. That said, Blackburn Rovers still managed to secure a £1.5 million sponsorship deal with Crown Paints. Wigan’s 188Bet contract ran for two years and is now up for renewal or replacement, so there might be an opportunity to improve the deal. Wigan have already had to replace former kit supplier Vandanel, after they went into administration, with MiFit. On the cost side, it’s all about the wage bill. Although wages of £39 million were cut by £3 million in 2010, the important wages to turnover ratio remained at 91%, which is only beaten by big-spending Manchester City’s 107% and is way above UEFA’s recommended maximum limit of 70%. This, of course, is a function of Wigan’s very low revenue of £43 million, but is hugely problematic. To place this into context, it only leaves the club £4 million to spend on everything else – or they make a loss. This is nothing new under the sun for Wigan, as they have battled with this issue for many years. In fact, the ratio was as high as 225% in their last season in the Championship, so it looks an awful lot like the promotion to the Premier League was achieved on the back of the financial doping so abhorrent to Whelan. In fairness, Wigan’s wage bill is one of the lowest in the Premier League and pales into insignificance compared to the likes of Chelsea £173 million, Manchester City £133 million, Manchester United £132 million, Liverpool £114 million and Arsenal £111 million – not really a level playing field. Little wonder that the chairman has advocated salary caps for so long, though it is clear that Wigan already operate their own ceiling, as was seen when they rejected the chance to re-sign Jimmy Bullard, with Whelan describing his wages as “astronomical”. This struggle to maintain a competitive squad without paying over the odds is at the heart of Wigan’s financial challenge. Their dilemma has been made even more difficult by two recent developments: the introduction of the 50p tax rate for high earners and the weakness of Sterling, both of which require increases to produce the same net salaries for foreign stars. 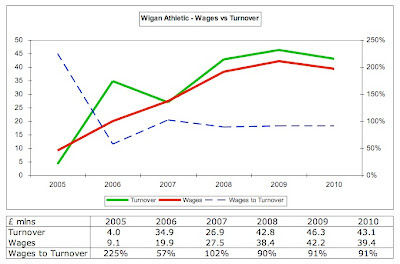 That said, it is likely that Wigan’s wage bill will further reduce in the next set of accounts, as these will reflect the departure of some of the highest earners like Paul Scharner, Titus Bramble and Jason Koumas (on loan). However, if they wanted to lower their wages to turnover ratio to a more reasonable 60%, they would have to cut their wage bill by a third from £39 million to £26 million. Alternatively, they would have to grow revenue by a half from £43 million to £66 million, which would be ambitious to say the least. The other expense that has been growing over the years is player amortisation, which is the annual cost of writing-down a player’s purchase price. For example, Mauro Boselli was signed for £6.5 million on a four-year contract, but his transfer is only reflected in the profit and loss account via amortisation, which is booked evenly over the life of his contract, i.e. £1.625 million a year (£6.5 million divided by four years). Thus, the total cost of player purchases is not immediately reflected in the expenses, but increased transfer spend will ultimately result in higher amortisation. In Wigan’s case, it has grown from £3 million in 2005 to £12 million in 2010, but this is still way behind a club like Manchester City with £71 million. Interestingly, Wigan are one of the few clubs that also explicitly include impairment losses for reducing the value of some of their players, which has cost the club around £4 million in the last three seasons. 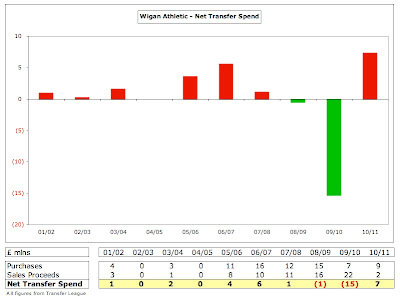 Wigan’s development has clearly been done on a budget with a net spend of just £5 million in the last decade. Although they splashed out £76 million in that period, they have recouped virtually all that money by profiting from some astute purchases. They have been rightly acclaimed for their ability to buy unknown players cheaply, especially from South America, with two of the best examples being Valencia (free transfer) and Palacios (cost £1 million). This is a testament to their scouting network, though not every purchase is successful, such as Boselli, who was loaned to Genoa, after scoring just one goal. Although Whelan spoke in the past of “£40 million war chests”, we can see from the financials that this was never going to be the case. Indeed, in the last couple of years, his objectives have been a great deal more pragmatic when it comes to the transfer market, “Roberto has to accept – like every other manager in the Premier League – that there has to be a limit on what they can do.” That has been helped by shrewd use of the loan system with recruits such as Tom Cleverley from Manchester United and Wigan’s player of the season, goalkeeper Ali Al-Habsi from Bolton. That explains why they have increased investment in the academy, as this has only really produced one player of note in the past ten years, namely Everton’s Leighton Baines. This is now starting to bear fruit with forward Callum McManaman being perhaps the brightest prospect. "Can Wigan hold on to James McCarthy?" 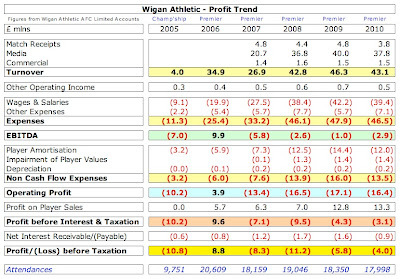 However, Wigan’s overall strategy is crystal clear, as stated in the accounts: “Maintaining a Barclays Premier League place remains a priority both in terms of football achievement as well as financial security.” This is self-evident, when you consider the importance to Wigan of “the considerable financial rewards from television monies.” Although parachute payments paid to clubs dropping out of the Premier League have been increased to £48 million (£16 million in each of the first two years, £8 million in each of years three and four), this would still represent a dramatic reduction for Wigan. They will receive £41 million revenue from the Premier League next season, so they would have to somehow handle a £25 million reduction, almost certainly meaning that they would need to offload players, making it more difficult to be promoted back into the top division – a vicious circle. Indeed, Whelan has admitted that six players would have been sold if the club had been relegated. Inevitably, some clubs gamble on getting back after one season, keeping most of their players and taking a financial hit that season, but they are taking a big risk. This support remains crucial to Wigan’s future prospects. Indeed, the auditors note “a material uncertainty which may cast significant doubt about the company’s ability to continue as a going concern”. Of course, many other clubs have similar warnings in their accounts and are equally reliant on the backing of their benefactor, so this does not mean that the end is nigh, but it does emphasise yet again the importance of Whelan’s financial assistance. Although Whelan has attempted to reassure the club’s fans, “There are no worries about the club surviving while I’m around”, there are two concerns here. First, while Whelan is very wealthy by the standards of British owners, he is not in the same league as foreign oligarchs and sheiks, so there is not a limitless well of money available. Second, this rather begs the question as to what happens when Whelan is no longer in charge. "Gary Caldwell - on me head, son"
The man himself admitted, “The trouble is I might not be around for much longer, as I’m pushing 75.” In a recent documentary on football finances, he told Lord Sugar that he would look to hand over the club “in the next three or four years”, as he did not want to burden his family. For the right person, who would “love this club and keep it going”, there would be no charge, though obviously the new owner would have to continue to fund the annual losses. Some fans might see this as a new dawn, but this is very much a case of be careful what you wish for. Recently, we have seen Birmingham City bought by a set of Hong Kong businessmen who are anything but transparent, while the Venky’s saga at Blackburn Rovers has only delivered comedy value to date. In any case, it’s not that easy to attract new investment. Just ask Everton, who have been in the shop window for years. 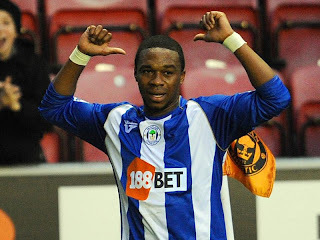 "Maynor Figueroa - another Honduran success story"
If Wigan were to qualify for Europe, which is one of Roberto Martinez’s stated ambitions, the club may then be more appealing to prospective purchasers, but they would also have to contend with UEFA’s new Financial Fair Play regulations, which force clubs to live within their means. These rules do not (yet) apply to domestic leagues, but it is something to bear in mind for clubs like Wigan that rely on benefactors. Anyway, that’s future music. In the meantime, maybe we should just celebrate Wigan Athletic’s ability to consistently defy the odds by simply surviving in the Premier League on such limited resources. If Martinez’s exciting young team manages to progress to the next level, that should be considered the icing on the cake. A rather interesting story/history of Wigan. I though they were an older club. An excellent piece as usual there. Thanks. Well done....what a fantastic article - you covered all the bases. Excellent work and perfectly written. I'm impressed. Really good read. Interesting article. It's given me more insight into one of my favorite underdog premiere league teams. Thanks for posting it. Great as usual. Just discovered your blog recently through Arseblog, but am constantly penetrating the archive. I just wonder, as I am Polish, if there is any chance of you investigating if there is any chance for Eastern Europe clubs to come back to the game at European level. As at the moment Polish League runner's-up annual budget is mere £5-6 million. Obviously the biggest impact on the finances would be qualifying for Champions League. But these are small chances with only Champions participating in qualification competing against the likes of Anderlecht or Celtic. I know that miracles can be produced as Dan Petrescu did with Unirea (from a town of 17 thousand maybe?) but as we can all see these exceptions are mostly based on lucky draw. I understand that Poland have not much talented players at the moment. There are no proper academies next to any top flight teams which is good enough explanation for poor football condition. But taking into account my country's neighbor Czech Republic which produced few generations of top class footballers in more than a decade this success has never reflected on the club level which simply have no chance competing financially with western parts of Europe. The fact struck me recently on the example of player from Lech Poznan (the club that defeated 3:1 Man City at home in Europa League) as he moved during January transfer window to FC Koeln which was fighting relegation. This moved tripled(?) his wages and now he demands more as the contract expires with the end of June and other clubs showing interest. And that is with Bundesliga having relatively 'low' wages. Szczesny wages are probably of a Polish runner's-up budget. Obviously English, Spanish, Italian, German or French both Leagues and clubs have most deserved brands but I'm just wondering if a sustainable model is possible for clubs from poorer parts of Europe to join the party and stay at that level. I understand that Europa League has been set up with this in mind ('Champions League' for poorer equivalent) but as I think I've seen in one of your articles the winner prize money is less than for competing in Champions League group stage, please correct if I'm wrong, which doesn't really help developing those poorer leagues. how does the away refunds work;i thot wigan would actually make more money out of away refunds than from home revenue.pliz explain. I read the blog on and off, but as a Latic, I was pointed in this direction. Interesting, I knew we had Lots to Thank Uncle Dave for, but I'm now more in admiration of him and Roberto for the Jobs they are doing. Good article. I hope this will be read by those who persistently harbour the untrue thought that Mr Whelan pockets all the profits of Latics. One of the most balanced views I have read about WAFC, and alot, and I mean alot more intelligence used than the lame stream / 'only well supported teams deserve to be in the prem' media that just say we are a rugby town and do not realise that as a percentage of the town/city compared to most we have a very health (approx) 20% of the local public attending games and as you mention we have lot of our local people who moved here from Liverpool in the 70's and alot of passed down Man U supporters. Just one mistake we bought Valencia for £3 million, and I am being pedantic mentioning that. But I have to thank you on actually doing some reporting about our team and I will be sharing your blog with friends, Well done. Excellent article as always and thanks for covering this issue and yes I bothered you for a while to cover to Wigan. Very well balanced especially how much of an influence Diamond Dave Whelan he has on the club. He definitely has his moments of stupidity, though he has finally learned some patience when it comes to backing managers. They're always going to be a selling club and they academy needs to develop further. It's just they have to be able to get the right prices for these players. There isn't much crossover between the RL and football club, in fact many of the RL fans want them to fail, when in fact it's in both best interests for them to be successful. 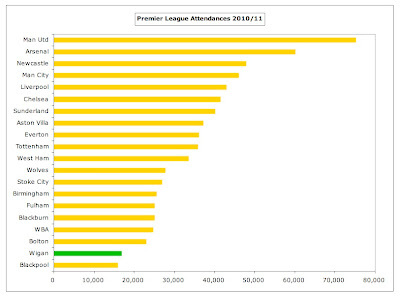 As for fans, well there is Man U, Man City, Everton, Liverpool, Blackburn, Preston or Bolton within a very short geographical area, so Wigan's attendances are quite good considering where it was 10 years ago. The key to Wigans's survival in a league where their budget says they shouldn't is as Dave Whelan has said, astute managerial appointments. The best of those has to be Martinez. That man is going places. listening to his press conferences and post-match briefings last year, he kept a remarkably level-headed yet positive stance. He's intelligent, a great communicator and is the sort of person who keeps tier head when others around him are losing theirs. Of course, it helps to have a solid, supportive Chairman but I don't think many managers could have kept Wigan in the Premier League last year. All season I had them as certainties for relegation, yet when I heard Martinez speak at different times during the season, even though Wigan's position seemed dire, I somehow believed that relegation was not the inevitability everyone was saying it was. I'm a cynic, so if his demeanour and vision turned my head, he must be good. Great read as ever. Accountancy's gain was journalism's loss. The piece does leave me wondering though whether to laud the tale of a plucky little club that could - and did - or be appalled by the notion that it is only financial doping that let it. PS. Typo crept into the Arsenal wage bill, which seems to have lost a 1. Even Arsenal's parsimony can't get it down to £11 million. Thanks for those kind words and for alerting me to the typo. Excellent analysis as usual. One thing that crops up again here, and continues to puzzle me, is how incredibly, ludicrously cheap it is to sponsor a Premier League club. Sure, £20 million's a lot of money, but compared to, say F1, where Red Bull are paying something like ten times that amount for far less exposure, or the Olympics, where lead sponsors are paying more like a _billion_ dollars, it seems pitifully little. Certainly, for a club like Wigan, who are seen on TV playing nearly a quarter of their matches against the top four clubs, the exposure you get seems worth far more than a million or two per year. The writer is a doom and Gloom merchant. He lost me when when he said, "an extra £1.3 million and 5000 extra fans would make little difference". To infer the only benefit is a slightly better atmosphere, is ludicrous. Let's also ignore the extra compounded spending those extra fans would create, followed by further growth and interest in the club. Underestimated value or what. Regardless, the fan base has fallen since our first season the Premiership. Whelan will blame the fans. The fans know better. Mr Scrooge lost my gratitude, once he'd he spoke in business terms only about Latics. He'd sell tomorrow if he could. He wants out to save himself, and his family which proves he cares very little for Wigan Athletic FC. He cares about his money though. He'll buy Christopher Park. Not for Latics. Welco will own it and rent it too Latics. Before Whelan, Wigan owned it's own Stadium. Now it has to rent it of Whelan, no different to the Warriors. Yes he invested in Wigan Athletic the club, and at the same time stripped the club of all tangible assets. He turns his investment, he now calls a loan into equity for himself. He got Latics into debt, and now he simply wants his money back before he kicks the bucket. Can't say I blame him, but don't pretend it's all for our benefit. The writer then completely fails to mention how Mr Whelan's own personal advertising coverage has had astronomical worth and value to Whelan over the years. I don't even think Whelan could put an actual figure on its true value, but I'm very sure he's make sure it was low, like the wonderful businessman he is. Wigan Athletic generates a massive amount of income. The football club provides a very generous livelihood for many, starting with the players and Manager, right through to lower Management. They are all Living well of the back of Latics. Banks do very well out of us too. All Premiership football club owners have borrowed too much in an effort to out do each other. Mr Whelan has become a small fish in a big pond. He can't compete we all the new big boys. He winges about it now, and talks about a fair play league, but he had no problem outspending other poorer clubs in the lower leagues at the time. Now he can't compete, he doesn't agree with it. Two faced when it doesn't suit. We shouldn't be grateful for this as football fans. We should be disgusted with it. Also Whelan only cuts the price of tickets because he has too. He doesn't do it to help loyal fans. He'd charge more if he could, after all hes a businessman before you forget again. Overpriced tickets throughout the Premiership does nothing for all football fans, and if fans stay away, then the prices will fall, as we have seen at Wigan. Whelan had no problem giving 2 million of his wealth to the Tory Party, after all, what better way to write it off against taxes. It doesn't all have to be doom and gloom. Whelan could put in place a business plan to sustain Wigan at an affordable level when he's gone. He may yet surprise me. I think not. He'll go on convincing people we should be grateful for his business mistake. No wonder fans stay away. He tells them to buy season tickets, then slags them off. If you trust someone like that, you want your head seeing too. Annoy at June 18th, kop on! Dave whelan has questions to answer in my opinion but mr. Swiss ramble ( or the writer) as you call him is extremely balanced and analytical in his investigation. Twice he makes references to the benefit Whelan accurs from his investment into Wigan e.g. Free advertisement and then the cheap shirt sponsorship deal. On the whole, I think it's an excellent article and furthermore I think whelan is good for the club overall! Palermo - Pretty In Pink?